So I've been mulling over beginnings, fresh starts, new ideas this first week of the new year. I"m not much for resolutions; the word itself raises the hackles of the rebellious teenager in me. 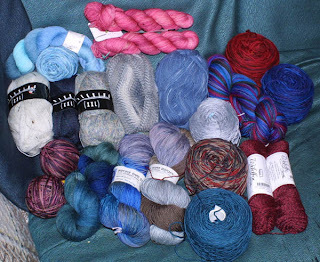 Some thoughts percolating for a while have manifested in the form of "__-along"'s, such as Knit from your Stash 2007 and 100 miles by April 1st. 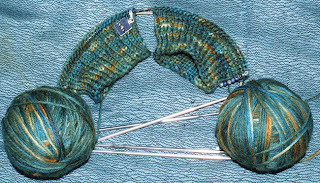 It seems that Project Spectrum 2.0 fits nicely into my planned 2007 knitting, so I may as well join them all! Too lazy to add buttons right now, however. Ahem. I added some reinforcing yarn to the heel. It's not nearly this contrasty in real life, but I love the subtly shifting color thang of the trekking. 2. Finish thuja socks for nephew . Same yarn, pattern, and size as ones for Dad. Should go fast. 3. Knit jaywalkers for niece, out of Lisa Souza sport weight merino once it arrives. Should go fast, she's only 7 with a 20cm long foot. 4. 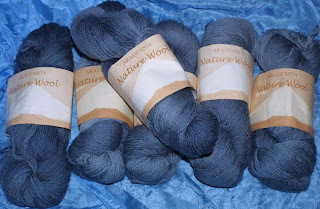 Knit Bonne Marie's Ariann out of Araucania Nature Wool, procured from Webs over the New Year's weekend, on closeout! 6 skeins for under $30!! 5. Knit Hourglass sweater from Last Minute Knitted Gifts out of natural silver alpaca from A Touch of Twist. Or some variation thereof. Many thoughts swirling, will get back to you. I see some Project Spectrum potential in that pile! 7. Finish the Clapotis I started before Thanksgiving and gift it already. Fortunately (or unfortunately depending on your perspective), the giftee has no idea it is happening, so no motivation to put it tops on the list. Non-knitting goals are not so concrete. I know I want to be more fit, and for motivation Runagogo fits the bill. My plan is to ski my way to April on my NordicTrak--no snow required! Which is a good thing given the high today was a balmy 70+F. I would also like to do more sewing this year. I have some fabric and vague ideas. The rest of this month is going to busy, too. My parents arrive Thursday night for Flyboy's birthday on the 14th (FOUR! He's going to be four!) Then T, Flyboy and I jet off to Disney World for a long weekend. Somewhere in there I must send off my Secret Pal 9 package. It's almost ready. 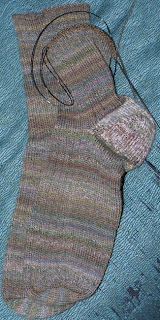 Maybe I can finish T's sock tonight or tomorrow, and put one goal into the completed category. Busy Busy Sunshine! I am glad to see you are knitting so much! And glad you put that it was Flyboy's birthday! Good thing you haven't been around here, seems the plague keeps visiting us! I miss you and can't wait to see you. I am even pondering the idea of going on Tuesday night, will you be there? Love you!